By Hitesh Raj Bhagat, ET Bureau: This cute little fella is the mBot — a do-it-yourself educational robot kit from robotics experts Makeblock. 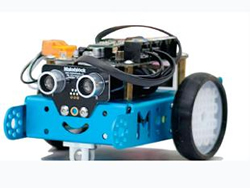 Built around the Arduino open-source platform, it's designed to induct kids into the fields of robotics and programming. The company chose to build around the concept of STEM education: science, technology, engineering & mathematics. Specifically, it helps children get an early start into these disciplines. There are two versions of the mBot: a Bluetooth version for home use 2.4Ghz WiFi version, which is designed for classroom use.